The River Wharfe has many bends, especially where its valley is wide, and thus lives up to its name, which in Celtic means ‘twisting’. A river bend is called a meander. The river is flowing towards the camera on the left and away from the camera on the right. As it comes towards the camera it is heading straight for the bank where I am standing. But the shape of the channel sends it around the bend. This means that the fastest flow, the strongest current, is right below the bank on the outside of the bend. The strong flow easily picks up any loose material and gradually erodes the bank away. So I am actually standing above a bit of a cliff. 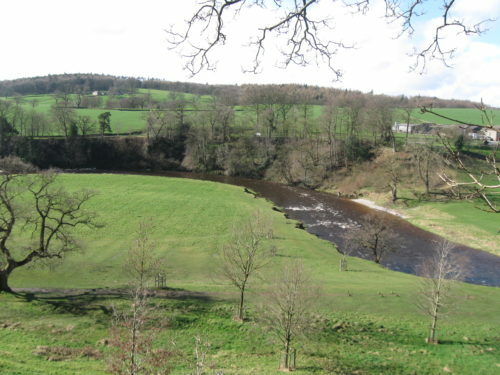 Here’s another meander on the River Wharfe. Now you can see the steep bank on the outside of the bend. The trees at the bottom of the slope look rather unstable, with the water washing away the soil around their roots. The land on the opposite side from the river cliff is lower and flatter. Can you find your own example on a river where you live? 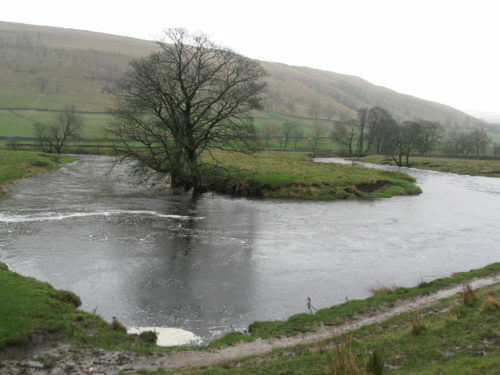 Next week I’ll be telling you about a beautiful but sinister spot on the River Wharfe.